Merry Christmas and Feliz Navidad to all! The DH is away for the holidays, visiting family in Venezuela (illness in the family, positive energy appreciated), so I’m spending my evenings after work baking ALL the things! Followed promptly by eating all the things. Followed less promptly by cleaning all the things. This is the gingerbread house I made with the leftover gingerbread dough from the gingerbread men that I made as little gifts/here-I-thought-of-you-plus-a-card for colleagues. And then I scrounged around for candy to decorate it with. Apparently I have a lot of candy lying around the house. I don’t know if you can see it, but there are little gingerbread men doo-dad thingies (those sprinkle thingies, what are they called?) on the mini Christmas tree shrub beside the house/cottage/rustic chapel-esque building. Aren’t they adorbs? Totes adorbs! say blog readers, channeling 12- year-old texting tweens. It’s not the fanciest gingerbread house, obviously, but for leftover dough and scrounged candy, I think it’s cute, in a slap-dash sort of way! Since it’s Thursday, it’s time for Memories of Meals Past! 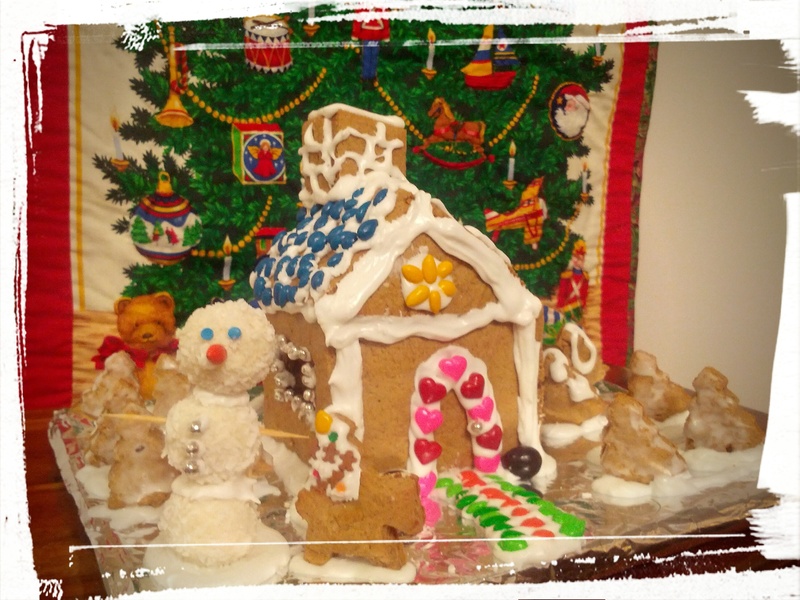 This gingerbread house qualifies since I made it on Monday evening. (I love making up blog rules. So freeing! So liberating! So bendable to my will!) I used a royal icing recipe from Wilton, this one, since I couldn’t find my mum’s tried-and-true version. It’s a good recipe — beats up nice and glossy, but I still can’t find the perfect recipe. I think I prefer my mum’s over this one, as this one is a bit too thick. Or maybe I just used the wrong piping tip. Totally likely. Meh. Still tasty! Hope you’re enjoying lots of tasty things today, with friends and family! And here’s to a fabulous food-and-alliteration-filled 2015! Next Post: Probably about New Year’s resolutions. And salad. Because I ate all the things (see above). This entry was posted in Memories of Meals Past on December 25, 2014 by Margaret.